These disciplined spearmen lack armour and while able to hold the battle line are not the equal of their heavier cousins. They are best used when their flanks are protected. Doryphoroi Pontikoi are raised from peoples that live around the Azov Sea and the northern coast of the Black Sea and that have been subject to substantial Greek influence. This includes both original sedentary Maeotic and Sind tribes, settled groups of former nomads such as Scythians or the Sarmatian Siracae and also the Greek towns of the area. The non-Greek populations of the region have been long subject to substantial Greek influence, which is quite evident in, for example, the large oval shields of the thureos type that these infantrymen carry. That shield is typically their only protection. To it, they add spears and short swords. Thanks to their shields, they may face the many archers that their potential enemies are likely to field with some confidence and their spears allow them to fend off the light cavalry that is also common among their foes. They will also hold their ground against infantry similar to themselves. However, truly heavy cavalry, not to mention quality heavy infantry will get the better of them sooner rather than later. Historically, by the 3rd century BC oval shields with long spines and spindle-shaped bosses spread and became common into the areas around the north coast of the Black Sea. The whole region had long maintained strong connections with the Greek world and this particular process followed military developments in the Hellenistic world. 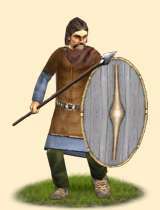 Infantry men equipped with oval shields and spears became common among the diverse ethnic groups that inhabited the region and for several centuries they formed part of the armies of a variety of nations including the Pontic and Bosporan kingdoms, Scythians and Sarmatians, Greek colonies of the area and Armenia.